I think I'm supposed to say something about cookies for the benefit of European readers. CLICK TO LEARN MORE--INCLUDES A VIDEO FOR ALL YOU TV JUNKIES!!!!! 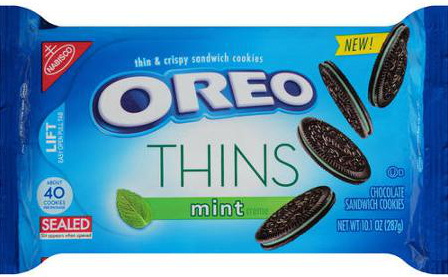 Secondly, I love those new Mint Oreo Thins. Very crispy. I was never the kind of person who broke the cookies apart to lick out the cream. Frankly, I find such behavior disgusting, and have to look away when people do it. And don't get me started on how my wife eats the cheese off a slice of pizza and then leaves the crust curled up in the box like a dead fish. People are always telling me how sophisticated Europeans are, so I'm sure people in Europe eat Oreos the way I do, neat and proper. So I hope those Thin Oreos are available to my European readers; this fine product of the Nabisco company has the endorsement of my blog about books that nerds and snobs read.